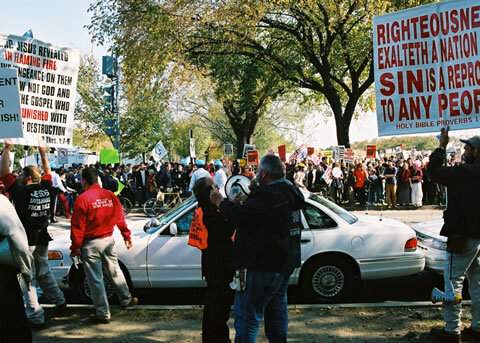 WASHIGNTON, D.C.- Members of the Street Preachers’ Fellowship traveled to Washington, D.C. the last weekend of October to preach to approximately 60,000 “falsely so-called” Peace Activists marching on Washington to demonstrate that though “peace” and “love” were on their protest signs, “war was in their heart” (Psalm 55:21). Such was proven clearly within the first five minutes SPF preachers were in the midst of those “that count it pleasure to riot in the day time” (2 Peter 2:13). 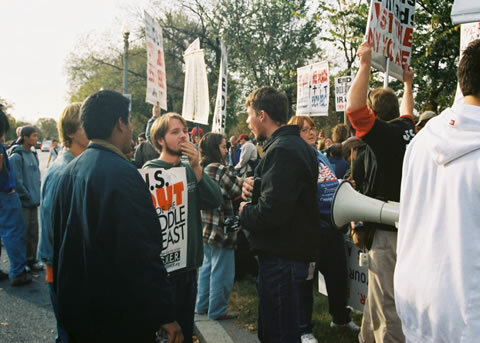 North Carolina State Director Dean Moore, and SPF Journal Editor Stephen McRae had just unfurled their banners and signs near 17th and Constitution Avenue, when the young evangelists Stephen cried to the nearly 10,000 people close at hand, “There is no peace, saith my God, to the wicked” (Isaiah 57:21). 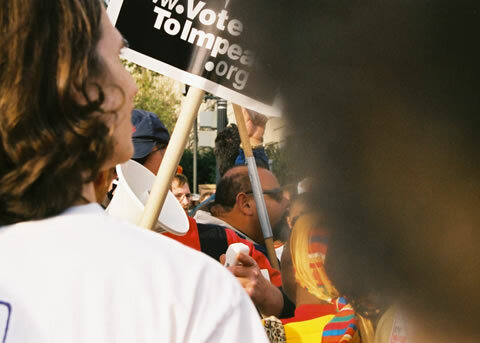 Immediately, approximately 50 men dressed in brown jackets and green vests acting as the volunteer security for the Peace Demonstrators charged full force into the two street preachers, and attacked them from all sides, quickly separating the two ministers, and then commenced to knock them down to the ground. NC State Director Moore proved his size had the manliness to match, and though beset all around, with men striking him and pulling at him, and doing everything to take the bigger-than-life street pulpiteer to the ground, Brother Dean stood like a rock, slinging sodomites hither and yon. In the fray, the rioters tore Brother Moore’s sandwich sign from around his shoulders, which only freed his hands. SPF Editor Stephen McRae immediately had his truth horn torn from his grasp, which when he determined to not let it go, the attackers lunged for his banner, and tore it down. With his banner thrown to the sidewalk, the attackers began ravaging it, and trying with all their might to tear it to shreds, while 15 to 20 men pounded, and pushed and surrounded the 21 year old street evangelists. Looking over his assailants, Brother Moore saw the young man Stephen go down in the midst of his attackers, and without another second’s hesitation, the big North Carolinian came like a bear through the midst of the rioters, and began slinging whatever came within reach back away from his fellow street preacher. Busting through the crowd of rioters, Brother Dean had Stephen back upon his feet, and without a seconds hesitation, as in a well rehearsed reaction, the two street preachers went back to back, and Brother Dean immediately began reproving the rioters, and preaching they were “all going to hell”. Again the falsely so-called Peace Activists “cried with a loud voice, and stopped their ears, and ran upon them with one accord” (Acts 7:57), and for the second time, the young man Stephen followed his name sake down to the low side of the city (vs. 58). 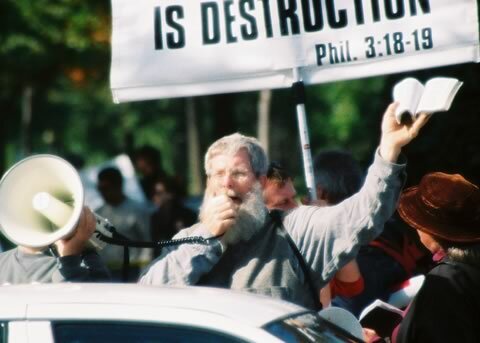 Being outnumbered 30 to 1, the two street preachers determined to not be separated, and as the younger again jumped to his feet and faced the angry crowd, he was able to gain back the truth horn which the rioters had just ripped from Brother Moore’s hands. Again, the two preachers went back to back, and Stephen proved again they were there to preach, but revival was breaking out before the sermon could go on, and the rioters came forward in their rush to the altar. This time the attackers came with ropes, and began attempting to tie the preachers up, and in a maddening rush, tried to run the rope around the two preachers to bind them together, so they could take them both down. The evangelists ever able to recall important scriptures from memory when needed, felt themselves both were like unto Paul, and had done “nothing worthy of death or of bonds” (Acts 26:31). Hence, they with one mind, and one heart, exited stage right through the ring of assailants, and were quickly met with police coming to their aid. 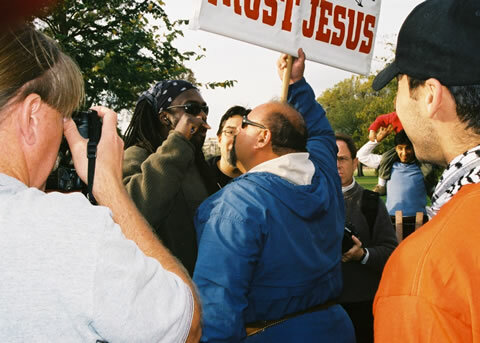 Contacting the SPF Director who was at the time in route from the BWI airport with West Coast Assistant Director Ruben Israel, the street preachers advised they would be standing their ground, without further preaching until the Director’s arrived. 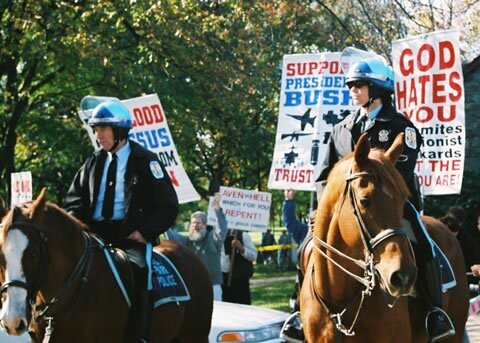 However, with the Police also outnumbered, the standard reaction of law enforcement towards the unruly and riotous blasphemers took control of the situation, and the police formed their crowd control line, and leaving the rioters to riot, they used their P-24s to shove the street preachers across 17th Street “for their protection”. Said Director McRae later, “It is always amazing how the men with the guns and clubs are more fearful than the preachers with their Bibles. These tactics are just the tin badge instincts of a lot of law enforcement personnel to remove themselves from harms way, while pretending to protect the street preacher. It’s called, ‘I’m out of here in yellow! And let me take you with me for accountability’s sake!’ In so doing, the rioters busy themselves with shouting a false victory while the police escape having to combat the rioters, and the street preachers aren’t martyred, and maybe the judge will chalk it up to professional riot control tactics if the preachers complain”. Upon arriving a short time later, SPF Director McRae immediately met with US Park Police Captain Walters, Sergeant Scott Fear and U.S. Department of Interior Senior Attorney Randolph Myers and spent the next hour litigating the SPF’s position. 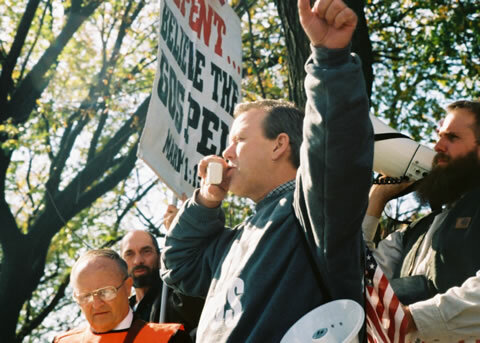 During the discussions, all the SPF preachers gathered into one tight perimeter, and preached their hearts out at the ever growing multitude of warmongering peace protesters. Director McRae patching Chief Counsel Len Brown into the discussions over the Captain’s cell phone, he was able to provide the SPF attorney’s with on site information, with which Attorney Brown consistently argued the Street Preachers’ position of no compromise. 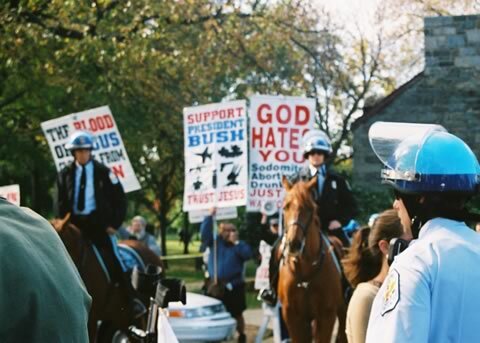 The Captain repeatedly demanded that the preachers be moved back 120 feet from the rioters, and the Police would rope them into a yellow taped circle beneath some park trees, which Director McRae refused to abide with. Director McRae persistently argued that the police should call more troops if necessary, and do their job in controlling the rioters, rather than silence the preaching by moving them beyond hearing. Said Director McRae, “Captain Walters, if you will order your men to do their jobs, we will do ours, and God Almighty will take care of both the preachers and the police; and this godless bunch of riff raff will get what’s coming to them from God.” Unable to persuade SPF Chief Counsel Len Brown and Director McRae to give in, the Captain finally capitulated and ordered more men to the intersection of 17th and Constitution. Said Captain Walters, “Okay, Okay! 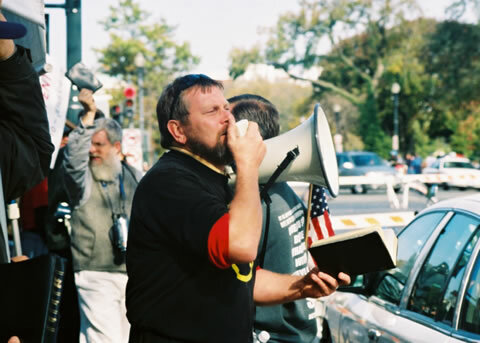 You guys are not backing up, so stand your ground on that side of the street, and we will try to keep them on the other, and we’ll see what happens.” And so it happened on that certain day, that 14 street preachers held forth the word of life against the rantings and contradictions of 60,000 liberal haters of God. 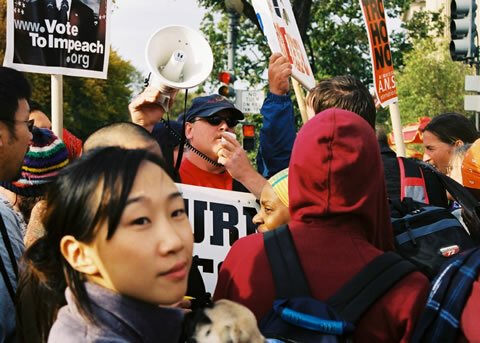 Gathering across 17th Street, the SPF street preachers held the curb line, as the US Park Police maneuvered police cars in front of them to help hold back the crowd if they charged across 17th street. Lining the middle of 17th Street, Captain Walters positioned his men with riot helmets to keep back the crowd of angry peace demons….trators as the Street Preachers preached “repentance towards God, and faith towards our Lord Jesus Christ” (Acts 20:21). 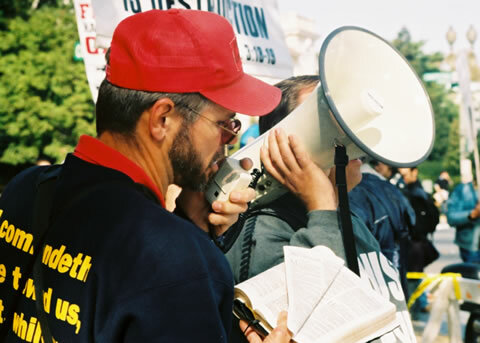 Then for two hours, each street preacher held forth, one after another, preaching “There is no peace, saith my God, to the wicked” (Isaiah 57:21). As each preacher drew sword at arm’s length, the crowd reacted in diverse manners. Some drew up close, others stood back, many came and inquired, and several “lewd fellows of the baser sort” (Acts 17:5) cursed and swore, while one Maniac of Gadera (Mark 5) growled vehemently at the preachers from across the way, quoting verses of scripture, railing on the King James Bible and the blood of Jesus Christ. Then it was Brother Kevin Deegan’s turn to “magnify the Lord” with his brethren (Psalm 34:3). The liberal Democratic candidate for President, the Reprobate Al Sharpton had mounted the Peace Platform to speak, drawing most of the demons….trators back up the Monument Hill, but the repose was just temporary. 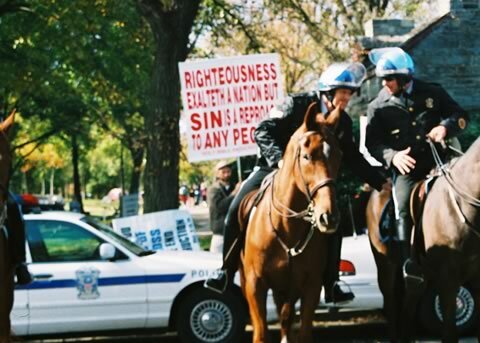 Brother Kevin Deegan took his place behind the police cars, and with Pastor Marvin Holmes assisting him, began preaching in his usual “great plainness of speech”. And suddenly the Reverend Al “Damn-Your-People” Sharpton had few listeners, as the “herd ran violently down” (Mark 5:13) the hill to confront the white boy from western New York with a Bible in his hand. "There are just some things that true men of God thoroughly enjoy. And this kind of evangelism is near the top of the list." And through it all, over 60,000 lost sinners heard the gospel of Jesus Christ, and were soundly reproved for their rebellion and lasciviousness. 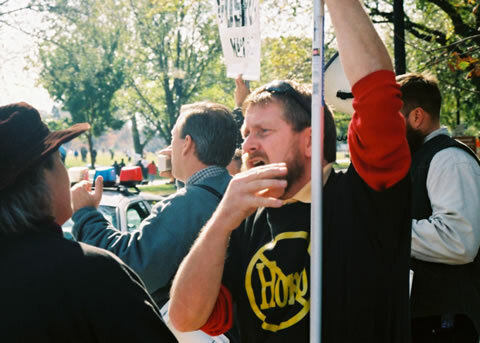 As the Peace Parade moved past the line of preachers, there were 14 Christian men having great fellowship with God and one another, in a surrounding that the majority of Christian pastors will never understand. 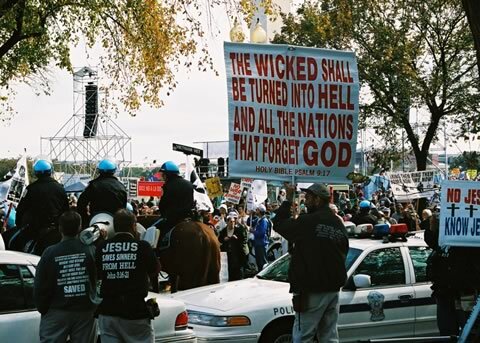 America hates God, and will riot in the day time to prove it! 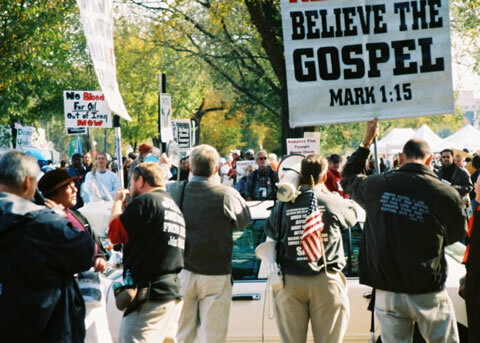 Open air preaching only uncovers how deeply the hatred runs after 50 years of God's weak kneed ministers confining the gospel behind four walls. 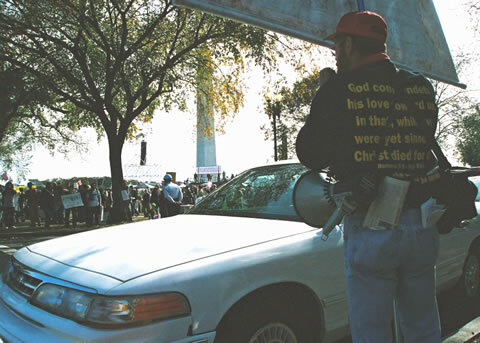 As the parade snaked toward the White House, the Street Preachers unfurled their banners, and repositioned further down Constitution Avenue, to "meet them at their coming" (Isaiah 14:9) back to the Monument. 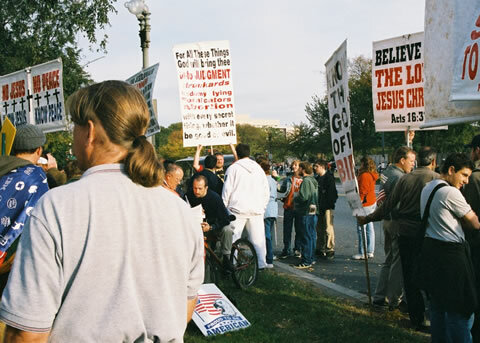 Repositioning at 14th and Constitution, the Street Preachers were now in the Metro Police Department area of jurisdiction, and when the Peace Activists ran the intersection, the city police did nothing to hold back the crowd, and the preachers were immediately surrounded on all sides. of the oppressor, as if he were ready to destroy? And where is the fury of the oppressor?" 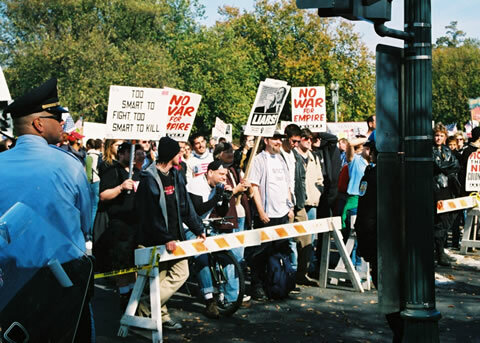 As the warmongering Peace Activists ran the intersection of 14th and Constitution, the Metro Police were ill prepared to stop them, and feebly repositioned themselves behind the preachers on the Monument side of the intersection, as over 20,000 demons….traitors swarmed the Street Preachers. Daniel Gowen, Tim Gruvers and Director McRae were able to position themselves with their backs up against a stone pylon on the corner, and held fast as they preached, the crowds unable to move them. Brother Ruben Israel and Dean Moore were surrounded within intersection, but the crowd could only shove them into the warmongers behind them. 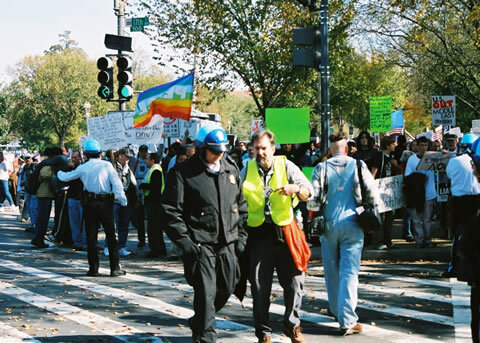 As the thousands swarmed the intersection, Evangelists Larry Craft and Kevin Deegan with the men from New York found themselves pushed 60 yards down Constitution from the intersection of 17th Street, and became separated from the other SPF members holding the intersection. As Director McRae preached with Brothers Gowen and Gruvers, the young SPF Editor pushed into the throng with his cell phone yelling, “Kevin needs help, their in a riot up the street!” Taking the call from Kevin Deegan, the big New York preacher yelled, “They have us surrounded with riot troops, and are trying to push us back over the fence near 15th Street!” Fighting through the ever growing throng of bodies, Director McRae instructed Brother Deegan to wave his banner high, so he could find them. Locating them across Constitution, the Director made his way through, and man what a sight! 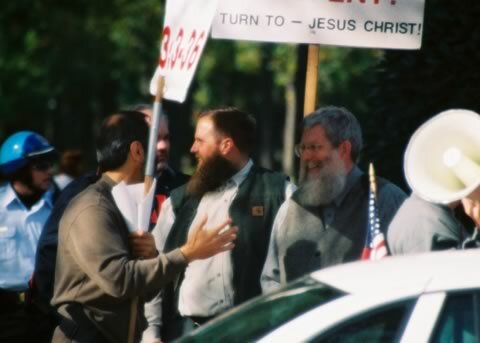 There stood those men from New York like a rock, with Evangelist Larry Craft in the center, preaching his heart out while evangelists Greg Davis protected his flank. The Street Preachers were completely surrounded on three sides, with their backs up against a snow fence, and a line of black armor clad riot police positioned between the preachers and the rioters. “There remains no more excuse from the Cowards for Christ, in confining the gospel behind four walls while our nation goes to hell by the millions. Yet, every preacher on the street that day was a witness (Acts 1:8) that Jesus Christ had been preached without reserve in the nation's capital, and discovered first hand that God does ever as He promised, saying, "I have put my words in thy mouth, and I have covered thee in the shadow of mine hand" (Isaiah 51:16). 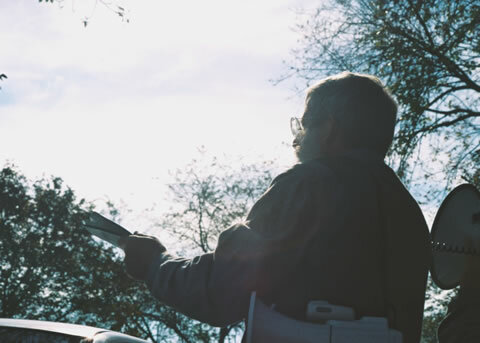 Though face to face with the ungodly, within an hour, the fearless preaching of Christ's cross had calmed the rage of the heathen, and it now fell to each Street Preacher to do follow up work in very personal ways. In the words of SPF Director Ron McRae, “There are some things in these “strange acts” of God that words and pictures just cannot tell adequately enough. Only the hearts and countenances of those courageous but few strange individuals we call Street Preachers could tell the story with full meaning. But those war stories are for us and Jesus Christ alone, when the tumult is over, and the Fellowship begins”. 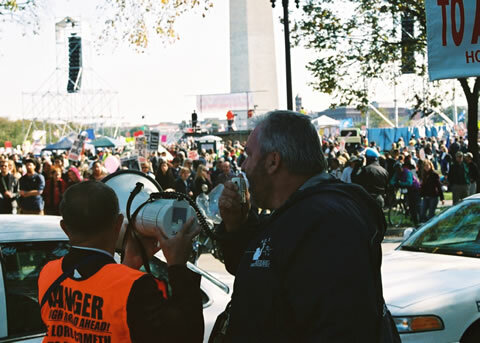 Kissing the Son in Washington, D.C.